NEWARK, N.J. — Brett Connolly has been doing his best Alex Ovechkin imitation the past six weeks and it is coming just in time to help the defending champion Washington Capitals gear up for another Stanley Cup run. "I have been playing the best hockey probably of my career right now," the 26-year-old forward said after scoring his career-best 20th goal. "I just really want to focus on being good going into the post-season. We have a good team and we are right there again. We're getting close to the level we need to be at." "Extremely consistent, confident, playing his best hockey," Reirden said. "He gets an assist as well. It was just a matter of time until he got 20. He has put himself in good spots to create offence and his mind thinks offensively, putting himself in dangerous areas. He's got a good shot and quick release and that will be key for us moving forward and having depth throughout our lineup." NOTES: The Capitals gave 38-year-old defenceman Brooks Orpik his first night off since Feb. 1. Djoos replaced him after sitting out the previous 10 games. ... Devils leading goal scorer Kyle Palmieri was hurt in the first period and did not return. ... Washington has not lost consecutive games since Jan. 22-23. .... Referee Jake Brenk was shaken up in the third period when a Capitals player crashed into his right knee. ... 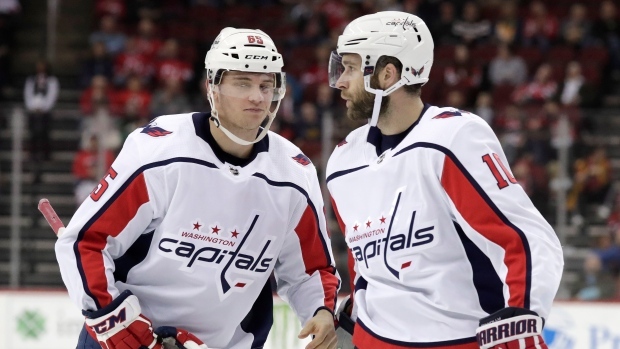 The Capitals are 16-6-2 against Metropolitan Division opponents. They have earned a point against New Jersey in 14 of 15 games (12-1-2).